It's been a few years since I've grown a winter garden, and this year was no exception. With the gardens still a major work in progress, I never got around to it. However, I'm determined next year to stretch our vegetable harvest across all four seasons, which means building a few cold frames and dusting of the fabric row covers. I've been so focused on flowers and landscaping lately that it will be nice to refocus on the vegetable garden. 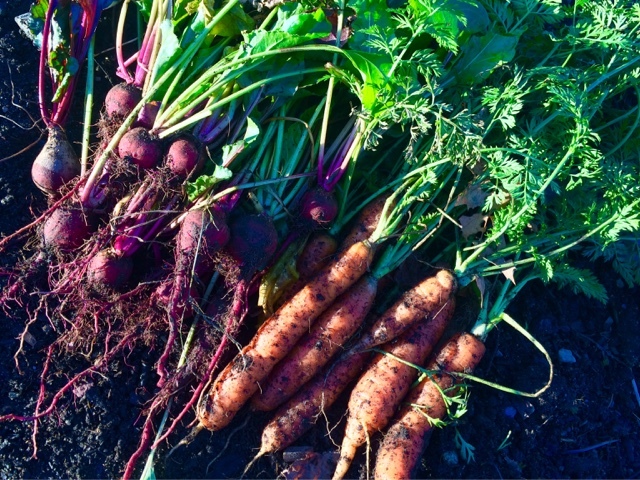 Even though winter is fast approaching, the garden is still offering up some tasty veg - like these fall carrots and baby beets. We'll get a few more carrots picked before the ground freezes solid, and then it will be time to order new seeds and plan for the next year's garden. Beautiful, Thomas! I can't wait to follow along as you grow all year long. Beautiful veg! When there is not much going on in the garden, these late fall harvests are all the more appreciated, aren't they? Wow, what a great harvest. For that it must have good weather and soil up there.Its nice root vegetables.Your sharing about it is very useful to know more about harvesting.Thanks for sharing.Take custom essay writing service help to improve your academic writing skill.